Dec 1 This is the first in the series of performance articles as part of my 2009 performance advent calendar experiment. Stay tuned for the next articles. As you've probably heard (and maybe all too often), we live in Web 2.0. This may mean different things to differently inclined folks but for us developers it means more rich Ajaxy pages, communicating more frequently with the server, one-page type of apps (think Gmail). Where "the web as she was meant to be" used to be a document-serving system, things are different now and web pages are increasingly more like applications, and much less document-y. 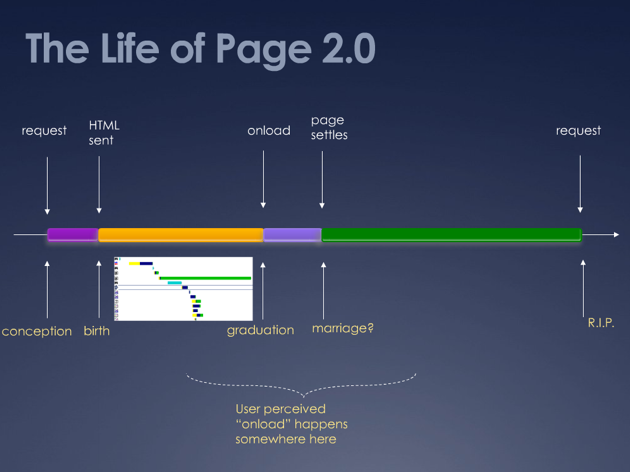 Let's take a look at what I once called (obviously still under the effect of that dental anesthetic) "The Life of Page 2.0" - a parallel between the human life and the modern day web app. On this timeline above you can see the key moments of the life of a page and how they correspond to the human life. Luckily if there's no complications, abortions, 404s and such, the pregnancy is over, HTML is sent to the browser and the page is officially born. Look, it even has a <title>, which is hopefully something different than "500 Internal Server Error"
Then comes the waterfall - downloading all the extra page components required by the page - images, scripts, styles... This phase ends with the onload event. This phase roughly corresponds to the childhood and teen years of our little human, which eventually graduates and becomes a full blown Mr.Page. Sooner or later along comes the Grim Reaper to end it all. The user clicks away from the page, making a new request and our Page is laid to rest after a brief onunload moment. First - if that looks like a lot happening, it is. The good news for the performance folk is that since there's a lot going on, it means there's a lot to improve. Performance optimization is a fun and challenging activity which is all but boring. Next - the onload. While technically onload is a concrete event which should signify when the page is ready, it's not always that simple. The "user onload" is an undefined point in time that could happen before the onload and way after. Depends on the page and on the user. An article type of page could be considered ready when the article title and content are ready. The user happily reads and hence interacts with the page, while images, ads and what not is still being downloaded. Other times the onload may happen relatively quickly, but the actual page content is still being retrieved (Google Reader on the iPhone comes to mind) and the page is far from usable. It's up to you to figure out the "user onload" for your type of page. Probably the first and most important place for optimization for most pages is the waterfall stage. But you can optimize the page in any of the stages above, prioritizing on where the most time is spent. Below is a summary of the main optimization activities in each stage, many of these will be discussed in follow-up articles. Thanks for reading so far! This first article was more high level, an overview of some of the more technical parts to follow. It's good to have a view. It helps you prioritize and adopt a more holistic approach to the optimization effort. At the end of it, it's a marathon, not a sprint.